TNA THURSDAY 14th JULY SITE VISIT: BRONZE AGE SITES ON ANGLEZARK MOOR - CANCELLED! Once again another fascinating and inspiring TNA Field Trip to Anglezark Moor conducted by Paul Bennett (The Old Stones of Elmet) & John Dixon (Journeys through Brigantia). Pikestones to Round Loaf – ¾ mile moorland walk from Pikestones. To Belmont Road at a point SD 647 152 to nip up to Noon Hill Tumulus SD 647 150. Then a short romp brings us up to the summit of Winter Hill to view the Bronze Age burial cairns located there – superb views over Lancashire, the Lake District & North Wales - & if we are lucky, the Isle of Man! GETTING THERE: To meet up at 12 noon @ Jepson’s Gate (Comvoy Meet Up: 11.30 to 11.45am @ the Hoghton Arms car park that stands on the Chorley Road as you come off the No: 3 M65 escape route). Where is all this consumer traffic going with such unacceptable haste and noise? 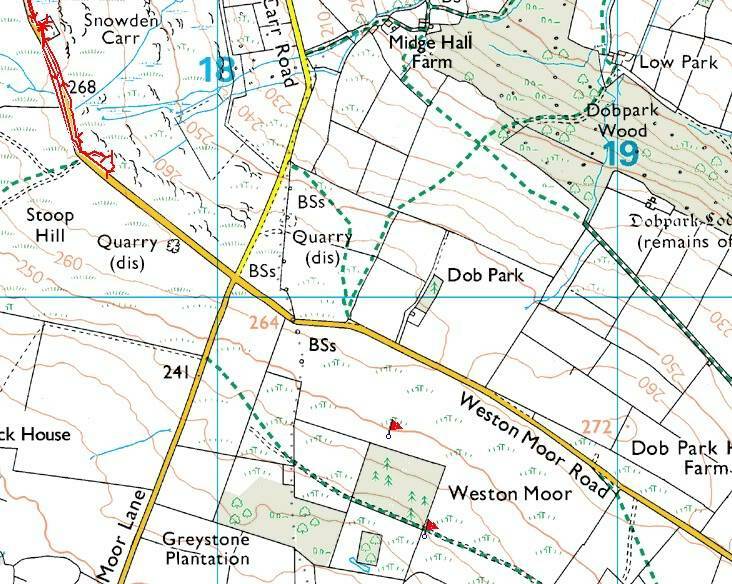 M65 to No: 3 escape route, then take A674 9 (Chorley) for 3miles to Heapey – then use a map to aim for north tip of Anglezark Reservoir then along Moor Road to Jepson’s Gate. Re: TNA THURSDAY 14th JULY SITE VISIT: BRONZE AGE SITES ON ANGLEZARK MOOR - CANCELLED! Toilets & Cafe at nearby Rivington Barn/Visitor Centre - also stone heads found during excavations for reservoirs are on display there. Just checked the route coming off the M65 from the east. The turn off to take at the junction 3 roundabout to the A674, is signposted 'WHEELTON', and the Houghton arms, (with a u) is some 150 yards on the left. That is clearly the simplest route to follow for those who don't know the area. I've just heard that John can't make this one, so the best thing is cancel until later in the year. I know he's very disappointed he can't come. But as he's the only one who can safely find the sites, It's off. My efforts to get to the round loaf, three in all, have seen me trapped in tribble, and desperate to get off the moor in fading light. I cannot make the Anglezark trip next Thursday as I shall be in Leeds on that day. If it is OK with everyone we could put the visit off till a later date. Yet there may be someone out there on TNA who knows the area well enought to lead. If so let TNA know. deadagaindave wrote: I've just heard that John can't make this one, so the best thing is cancel until later in the year. I know he's very disappointed he can't come. But as he's the only one who can safely find the sites, It's off. Soz things didn't really get going today. And to make things worse, when you ventured back and we wandered further onto the moors, we did the usual. A couple of prehistoric cairns were found (though nowt special up here); but as the evening grew longer, around 8pm we found some hut circles, then a couple of standing stones and - weirdest of all (you've gotta see this) - we all saw another stone on a small rise and each of us said summat along the lines of, "there's a stone up there, let's check it out" (in our own poetic manner). When we got there, the rock we'd seen was in fact a spring of water that looked like a rock!!! It was chalybeate and at the very top of the moorland rise, bubbling away. Truly bizarre. Annoyingly, mi camera had packed-up 30 mins before we got here so we didn;t get any pictures. So we're off up again in the coming weeks and going straight to the place, all cameras energized and ready! http://www.stone-circles.org.uk/stone/weston.htm with this reply :- I certainly do! The Greystone Plantation stones. One of 'em's a really good CnR, and there are a couple of others nearby as I remember. We also found a couple down in the woods many years back, which I've not returned to see. Mebbe have a look at them again sometime soon? lowergate wrote: I cannot make the Anglezark trip next Thursday as I shall be in Leeds on that day. If it is OK with everyone we could put the visit off till a later date. A huge pity John, but cheers for letting us know. I was really looking forward to having a gander at these sites; but if y' can sort out another date in the near future, I'll definitely be up for it mate! FAO Danny - howzabout the cup&rings between Summerbridge & Pateley Bridge a bit further north of the Greystone Allotment sites. There's some good ones there - and they're not too well-known about + a standing stone, settlement, etc. And there's some intriguing place-names on a moorland height a mile away that needs assessing. We're gonna do Blubberhouses at the weekend I think. Aw thats a shame! I was planning on coming to that - been meaning to explore round there for a while. Would love to join you if you go in the future. Advanced notice is always good for getting time off work too if possible.